The set is currently scheduled for a februaty 2019 release, but Wizkids hasn't updated their release schedule this year, so it could still get moved to march, theoretically. We know it won't be in stores on february 6th, as that is the week the last update included, so february 13th, 20th or 27th are a possibility. Release date will probably be february 28th (though february 20th is also possible). Wow, Marco, we've complained about the quality of Wizkids minis, but it looks like they've really raised the stakes with their latest D&D sets! All the examples (except for the Intellect Devourer) shown on the unboxing video are just stunning! Great sculpts, great paint jobs and they've even done amazing transparent effects on many figures. 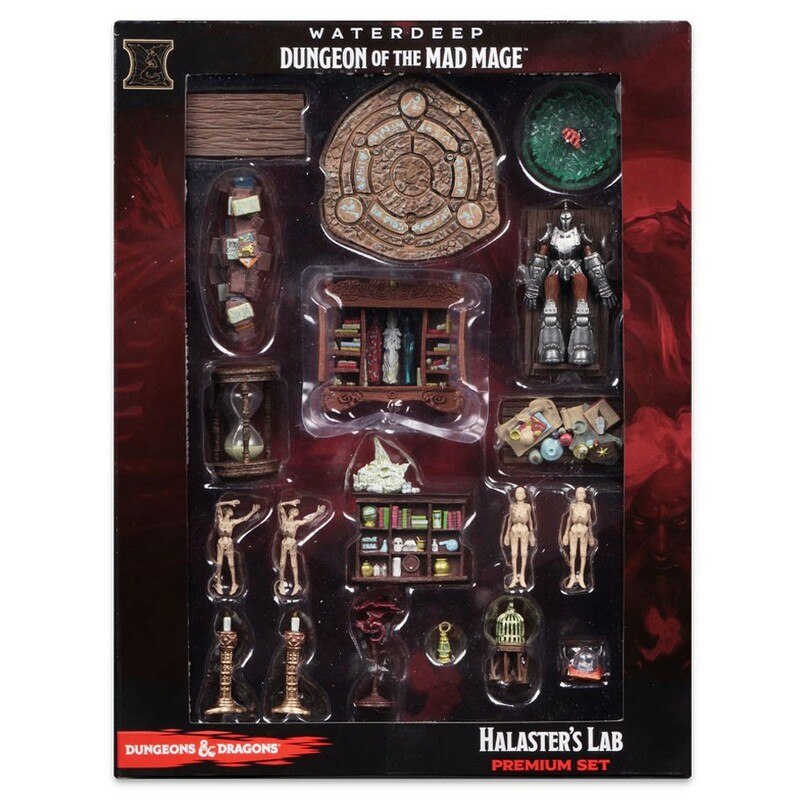 And even the tiniest details in that case incentive box (Halaster's Laboratory) also look excellent. I'm rooting for the upcoming Pathfinder Battles sets as well, hopefully they'll look as good as these! Ravnica was great & DotMM looks even better! I‘d guess it mostly depends on when the painting is done. Cinese new year is coming up, it’s when just about everyone drives home to meet the family. and it is when traditionally a lot of people don’t return to the jobs they left. When part of the crew is new and un- or under trained the quality will suffer. That may have an impact on "Ruins of Lastwall". But Kingmaker came out in october 2018 and had the absolute worst paintjob of all PFB sets imo & Ravnica came out in november and was nearly perfect imo! I think that the much higher sales of D&D and the financial power of Wizards of the Coast has more to do with that. Paizo isn't the apex of RPG anymore and the PFB minis don't sell as many copies as they did anymore, so they don't receive the A treatment anymore, but the B treatment. Legends of Golarion was the worst in quality IMO. it burned me from buying a set till Rusty Dragon. the minis still reek of too much paint if kept in an unventilated box. that was also an October set. there goes my hypothesis I guess. I am a little sad that i didn't order a full case and only two bricks and the incentive. With the exception of the "Intellect Devourer" & maybe "Piercer", every mini looks incredibly well painted and sculptured. Ruins of Lastwall on the other hand has only 6 minis so far that interest me. The fact that a HUGE FROGHEMOTH, which i wanted for years, is included as an UNCOMMON in every brick is mind-boggling. Ugh, they reverted back to having those Ultra Rare invisibles again. I was so happy when they got rid of them but I guess they are back. These look fantastic, especially the huge minis. I like the invisible minis, especially when they can be used for PCs. It isn't really the invisible minis that I'm opposed to. It is more the Ultra Rarity. I hate not being able to get a full set with the purchase of a case. Spending $300-400 on a case and then needing to spend another $50 or so to pick up any rogue Ultra Rares that I didn't get is just insulting. Since I'm a collector, I still do it, but to my displeasure. Getting a full set in a case, is one of the things I love about the Pathfinder miniatures line. Video on Halaster's lab right here.